Brazil is famous for many things; football, samba and beaches are often what spring to mind for most people. Everyone can name Copacabana and Ipanema but these are certainly not all that Brazil’s massive coastline has to offer. Just a couple of hours from Salvador de Bahia, and given barely a footnote in the Lonely Planet guide, are a few small islands, the largest of which is known as Morro de São Paolo (nothing to do with and nowhere near the metropolis which shares its name). Most information we could find on it was on other blogs and these almost entirely written by Brazilians, so we decided this would be a good opportunity to sample some authentic Brazilian beach life. We were not disappointed. There are a couple of ways to get to the island – a cheaper but more convoluted journey by ferry, bus and small boat, or when the weather is fine and by paying out a little more (75 reais each) you can catch a catamaran directly from the port at the bottom of the Lacerda lift in the old town of Salvador. We decided to treat ourselves to this option. Having had dubious previous experiences with catamarans Rich armed himself with seasickness pills and we set off to catch the 9.30am boat. The weather was on our side and the sea was calm so while Rich succumbed to medicinal drowsiness I sat on the back of the boat and watched Salvador retreat into the distance under blue skies. Two hours later we slowly rolled up towards the island. Ancient city walls greet you just behind the port, along with a picturesque old lighthouse. Lining the jetty were rows of wheelbarrows with the word ‘TAXI’ emblazoned on the sides – this is due to the fact that the island is entirely traffic free; the wheelbarrows are run by locals offering to lug your baggage up the steep hill on arrival and around the roads and beaches to your accommodation. Given that our hostel was a mere 5 minute walk we decided to go under our own steam but fellow Brazilian holidaymakers did look at us as though we were mad! The wheelbarrow taxi ‘drivers’ all wear vests emblazoned with their names – ‘Wanderson’ being my particular favourite moniker! The few actual streets in Morro have only recently been paved – by all accounts it used to be just sandy tracks until a year or two ago and a few have complained it’s ‘not what it was’ but we can confirm that the island certainly does retain a very relaxed feel and the lack of cars is bliss! Turning right off the main square we passed under a stone arch that read “Rua da Fonte Grande 1746” down to an old fountain (from around the same year) which formed the island’s water supply in years past and still flows today while doubling up as a precarious playground and climbing frame for the island’s children at dusk. Just past the fountain was our hostel; another HI-affiliated place (but much, much better than the one in Salvador) called Hostal Escorregue no Reggae. The name means ‘slide into the reggae’ in Portuguese; the colour scheme and laid-back owner back up the general theme! Recommended. We wasted no time in checking out the island’s beaches which are handily numbered rather than named: Primeira Praia is the first one you reach from the port, followed by Segunda Praia, Terceira, Quarta… you get the picture. As we walked onto Primeira Praia we were greeted by an Argentinian lady selling homemade empanadas which sorted out the issue of lunch pretty well and was just the first of many great beach snacks on offer. The next nice surprise was a series of makeshift bars with plastic chairs and tables selling cold beers while the sea washes over your feet. The French have the expression “pieds dans l’eau” that is used for anywhere on the seafront but this was a whole other level and probably one of the finest spots for a beer that we found; you just have to occasionally reposition your chair if a particularly large wave comes and destabilizes your drinking spot! The final surprise on this beach plummeted into view out of the corner of our eyes – a zipline that runs down from the hill on the island and deposits the user straight into the sea. It would have been easy to sit there all afternoon until the tide (or the beers) knocked us off our chairs completely but we carried on along to the other beaches; Segunda Praia is where the most action is in terms of bars/restaurants/watersports etc, and after that the beaches get quieter and a little more rugged. There’s something for every kind of beach goer really. There are other beaches, but time them right…or this is what you’ll find thanks to the tide. Fresh coconuts – drinking the water then scooping out the soft interior afterwards. Bliss. Açai – or “assa…EEEEEEEEE” as pronounced by the lads selling it on the beach: a sorbet of dark purple açai berries topped with chopped pineapple, banana and granola (or pretty much anything you want really). Grilled cheese – Oh yes. Sticks of halloumi-style cheese cooked right in front of you on little portable barbecues. This should be sold everywhere in the world, all the time. Acarajé – also found in Salvador and cities but great as a sunset snack – a fried back-eyed bean fritter filled with vatapá, a kind of shrimp paste, chillies…and some other great stuff which I don’t know how to make but do know how to eat. Don’t even bother playing beach sports unless you’re extremely good at it: From beach football to bat and ball or ‘keepy-uppy’ volleyball – if you’re going to give it a go you have to know what you’re doing. The competitiveness and level of skill on show on a family day on the beach or a group of friends having a kickabout is extraordinary and not exactly inviting to join in, but great to watch! These guys mean business. No 7-1 results here! I suppose the general conclusion is…Brazilians know how to do beach life. Morro is a fantastic and authentic spot to experience it without big crowds and away from the tourist hordes (although we were slightly out of season; it could be quite a bit busier at peak time, but a visit in May is highly recommended!). Sadly though, it was time to head back to Salvador for our final night in the Americas before our flight back to Europe. I won’t go into too much detail about our journey back to Salvador ‘the long way round’ (due to the catamaran being cancelled), suffice to say just don’t do it if you have any choice in the matter. Fork out the extra 20 reais for the catamaran if you can. Categories: Brazil | Tags: beach, brasil, brazil, hop on the good foot, Morro de São Paolo, photography, travel | Permalink. 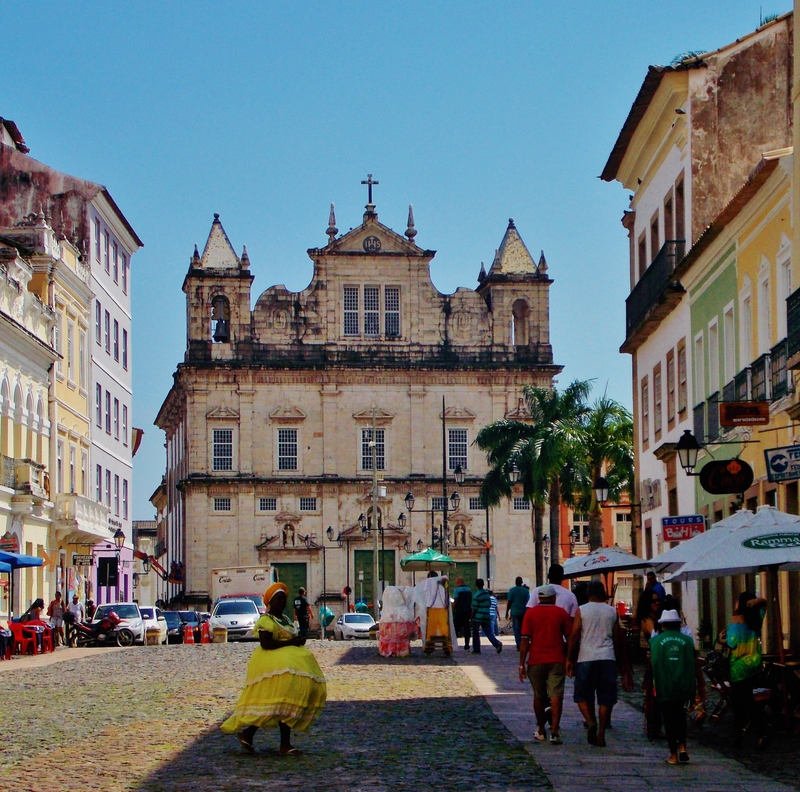 Drum roll… it’s Salvador da Bahia! After our whistlestop tour of Bogota it was time for our tenth and final country in the Americas…. Brazil! We’d initially had grand plans to sail down the Amazon and travel down the Atlantic coastline before realizing that: A) After two months of slacking in Colombia time was running out, and B) Brazil is big. Seriously big. So as our flight back to Europe was out of Salvador da Bahia we decided to focus the 11 nights remaining on seeing the city and finding a fairly local beach to sample some of Brazil’s (justifiably) renowned beach life. Driving into the city we sped past the recently renovated Arena de Fonte Nova, all shiny and ready for the World Cup (which is well underway as I post this blog but was a couple of weeks away while we were there). The city has a number of other ongoing construction projects (in varying states of readiness!) but we did get the impression that a lot of money has been put in by the government which, ready in time or not, should benefit Brazilians and ongoing tourism in general. 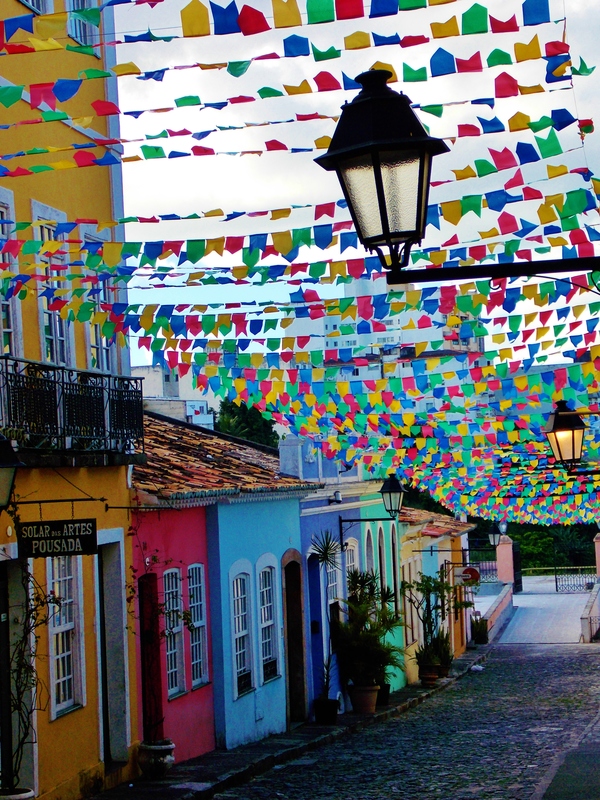 Arriving in the old colonial district of Salvador, known as the Pelorinho, is certainly an assault on the senses. Visually it’s stunning. Colourful and utterly beautiful. But the main assault is on the ears. Our hostel (Laranjeiras) was conveniently located between two carnival drumming schools, one of which is the famous Olodum, who performed in a Michael Jackson video and at the World Cup opening ceremony. They know how to make some noise. Deciding that a peaceful evening in was out of the question we wandered around the cobbled streets then settled in for the first of just a few caipirinhas in our time in Brazil. Those drinks wallop you fairly quickly so I ordered some much-needed hearty dinner of moqueca de camarão (a stew made with prawns, coconut milk, dendê oil and spices, served with rice and black-eyed beans). Our Brazilian education continued that evening, lesson two being: two caipirinhas is enough. A third is a silly idea. This cost 3 quid…so best put it in. Before I talk about sightseeing, it’s worth mentioning what we’d heard about safety in Brazil before arriving there. When people say a place is ‘dangerous’ I always take this with a large pinch of salt, as it has a lot to do with how you behave (i.e. wearing/carrying things that draw attention to you) and dumb luck. We’ve been to many supposedly dangerous places without incident and lived in London which isn’t exactly a protected bubble. That said, we’d heard several first-hand reports of muggings in Brazil as we traveled and what made us somehow more nervous was Brazilians themselves telling us to be careful on the streets of their own city. Hostel owners, the tourist police and restaurant owners would tell us not to go out at night or use a camera. It made us feel a little uneasy as the atmosphere, especially at night, did feel sketchy at times. However, we had no problem while there at all so this feeling may not have been justified. It seems perhaps that locals are aware of the reputation but want things to improve to bring more tourists in so encourage visitors to ‘not get mugged’. I’m not sure it has the desired effect, as it puts people a little on edge, but the intention is good I think. So, back to sightseeing. The old city is split into two areas: the Cidade Alta and Cidade Baixa (‘Upper’ and ‘Lower’ cities). The two are connected by staircases and a bizarre-looking huge lift (Elevador Lacerda) that whizzes people from top to bottom for just a few cents. The Cidade Alta is probably the finest preserved collection of colonial buildings we’ve encountered and despite having seen a fair few colonial towns over the past months, I was still stunned by the hilly streets and plazas here. You get a fairly standard amount of tourist hassle here (such as paying for photos with the fabulously dressed Bahian ladies and Capoeiristas in the square) but it’s mostly pretty good natured. Still after a couple of nights in the centre we decided to migrate to the more peaceful beachside district of Barra to see a different side of the city. Unfortunately the hostel we had in mind was full so were left with little choice but the HI hostel Albergue do Porto (Don’t do it. FYI, Hostelling International, a decent breakfast doesn’t make up for paying through the nose for a room that smells of piss.) Keen to spend the evening out, we strolled along the seafront past the old lighthouse and feasted on a dinner of garlic and chilli prawns before a couple of sundowners watching the joggers, strollers and dog-walkers of Salvador. Barra is a much more relaxing spot than the centre (major construction work aside!) and it made a nice contrast to see these two sides of the city. But city life takes its toll, so the only thing to do next was head to the beach…. Categories: Brazil | Tags: architecture, bahia, beach, brasil, brazil, city, hoponthegoodfoot, pelourinho, photography, salvador, travel | Permalink.